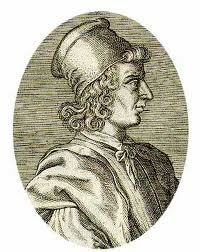 I’m reading Stephen Greenblatt’s The Swerve, a fictive biography of Poggio Bracciolini, the great book-hunter, active circa 1417 and pictured here in cute bucket-cap. It’s an illuminating read. Now all this may seem a tad harsh for a misplaced paperback, but recall that the curse pre-dates Gutenberg, so every book was hand copied and those illuminated manuscripts didn’t come cheap. Therefore we should make some judicious choices for our easier times: pick the hand-becomes-a-serpent switch OR the members-blasting palsy OR the entrail-gnawing worms. Any one of these will get your book-borrowing friend’s attention. However, you didn’t hear it from me. Yes, there are many more contemporary curses, like pox on one’s iPhone.